Ft. Dix, originally uploaded by cliff1066. The M110 is a heavy but highly mobile and maneuverable self-propelled artillery piece designed to provide general artillery support to infantry or armor over a wide range of terrain conditions. It can be airlifted in large cargo aircraft. 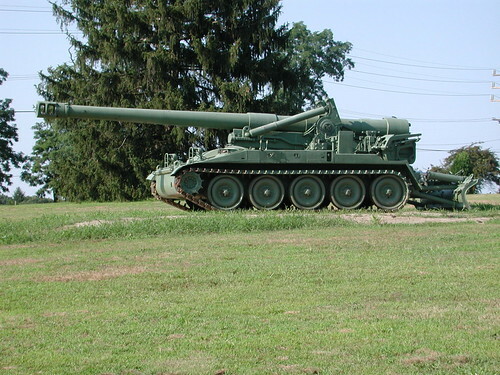 The M-110 entered service with the U.S. Army in 1963. The gun is an 8" Howitzer traversing in it's mount at the rear of the vehicle. The large spade at the rear is hydraulically operated. When lowered it keeps the vehicle in place as the gun is fired, opposing the massive recoil. The 8-inch howitzer fired a 200-pound projectile as much as 25 miles, while being the most accurate weapon in the field artillery of its time.